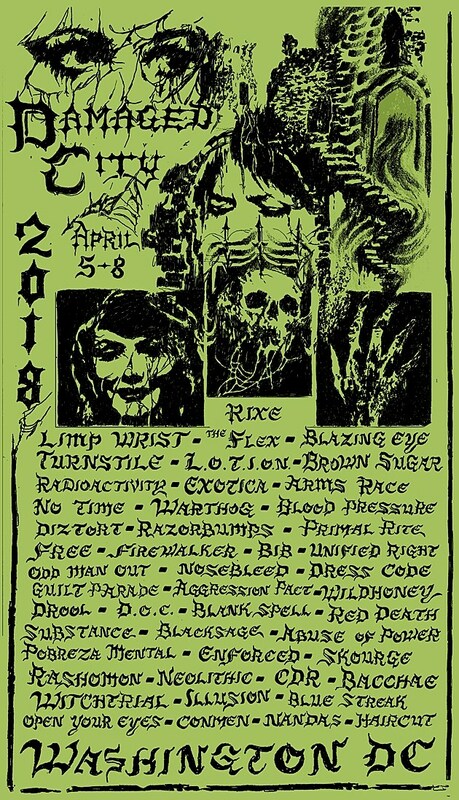 As mentioned, punk festival Damaged City returns to various DC venues April 5-8 with Turnstile, Limp Wrist, Radioactivity, The Flex, Warthog, Rixe, Wildhoney, Primal Rite, Free, Red Death, Razorbumps, and more. Ahead of the fest, the Damaged City organizers have made a playlist of bands playing, and we’re premiering that below. We’re also giving away a pair of tickets to a show of your choice, including the pre-show on 4/5 headlined by Turnstile, the main show on 4/6 headlined by Radioactivity, the main show on 4/7 headlined by Limp Wrist, and more. Enter on Facebook by leaving a comment with your show of choice. A winner will be chosen at random and contacted with more info. Good luck!